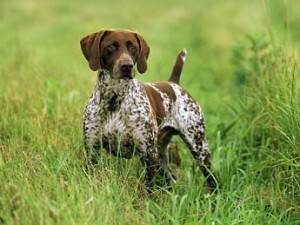 The German Shorthaired Pointer is descended from the old Spanish Pointer, which was taken to Germany in the 1600s. From that time until the first studbook was created in 1870, however, it is impossible to identify all of the dogs that went into creating this breed. Most-likely candidates for its ancestors include local German breeds such as the schweisshund, an early German tracking hound, the Foxhound, various French hounds, assorted Scandinavian breeds, the German Bird Dog, and the Italian Pointer. It is generally accepted that no Bloodhound was used as foundation material. In the late 1800s, breeders included the English Pointer to the foundational breeding program, adding style and run to round out the breed’s all-around versatility as a hunting dog. Prince Albrecht zu Solms-Braunfeld of the Royal House of Hannover is credited with encouraging breeders to select early specimens on the basis of function rather than form. It is believed that this enlightened guidance was instrumental in making the breed what it is today. The breed is streamlined yet powerful with strong hindquarters that make it able to move rapidly and turn quickly. It has moderately long flop ears set high on the head. Its muzzle is long, broad, and strong, allowing it to retrieve even heavy game. The dog’s profile should be straight or strongly Roman nosed; any dished appearance to the profile is incorrect. The eyes are generally brown, with darker eyes being desirable; yellow or “bird of prey” eyes are a fault. The tail is commonly docked, although this is now prohibited in some countries. Like all German pointers, GSP have webbed feet. 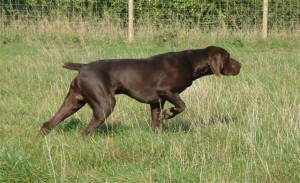 The German Shorthaired Pointer is very energetic, smart and willing to please. Cheerful and friendly, he likes children. Loyal and protective, he loves all family members equally, especially if they are carrying the leash, car key, gun or Frisbee. They are very people-oriented, and not happy if isolated from the family. If exercised sufficiently once or twice a day, the German Shorthaired Pointer makes a very agreeable family companion. If left to his own devices for long periods without exercise or companionship, he can become destructive and nervous. Males tend to be more outgoing and are more aggressive hunters than females. Females tend to be less dominant. Energy levels vary somewhat, as litters bred for high performance field competition may require more activity than the average dog. If raised with other dogs and cats from puppyhood, the German Shorthaired Pointer does quite well; however, he is a hunting dog by nature. This breed likes to bark and they are reserved with strangers, and make excellent guard dogs. The GSP has a longer life expectancy than many breeds of this size, commonly living 12 to 14 years, with individual dogs living to 16 to 18 years not uncommon. 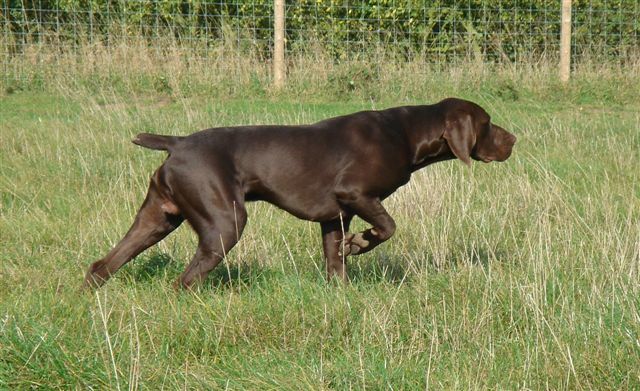 As the GSP is a large, active breed, the dogs can require considerable food; however, they can also become obese if fed too much for individual activity levels. A healthy weight should permit the last two ribs to be felt under the coat and the dog should have a distinct waist or “tuck-up”. Due to the short GSP coat, body heat management is not generally a problem. However, the GSP’s high levels of activity require the breed to drink considerable amounts of water to prevent dehydration. Early symptoms of dehydration show itself as thick saliva and urine with an excessively strong and distinct smell. The smooth coat of the Pointer is very easy to groom. Just brush regularly with a firm bristle brush and bathe only when necessary. This breed is an average shedder.